Lots of people – including “leading” economists – are freaking out about the debt ceiling. Saying things like we won’t be able to pay our bills, and that we’ve already agreed to the spending, and the US government will default on the debt, etc. Is it true? Or just a scare tactic so they can continue business as usual? Seems that most people are assuming that if the debt ceiling isn’t raised then the government will default. And while I agree that “The validity of the public debt of the United States, authorized by law, including debts incurred for payment of pensions and bounties for services in suppressing insurrection or rebellion, shall not be questioned“, that has zero, zip, nada to do with the debt ceiling. The debt ceiling is simply a limit on the amount the US is allowed to borrow legally. (We’ll forget for the moment that the Fed printing money to buy bonds somehow doesn’t count against the limit.) It simply means that we’ve hit the limit on the credit card. So we can’t borrow more money. It’s exactly the same as having tapped out your credit card, and the bank account balance is zero. But you still have a job, and you’re still bringing in a paycheck. What do you do? The typical family would disconnect the cable TV and Internet, buy generic food/toilet paper/soap, cut out the kids cell phones, start doing brown bag lunches, etc. They’d still make their house payment, still pay the electric and water bill, they’d still eat, the kids would still have a place to sleep, and they’d still be able to put gas in the car to get to work. In other words, they’d still function, albeit at a reduce level. What does the government do in the same situation? They pretend the sky is falling…. They have money to pay park rangers to block off access to existing roads/parks/scenic pullouts, they have money to give to the Egyptian military, they have money to invade Libya and Somalia, they shut down existing web sites (such as NASA and even the official time site) instead of leaving existing content up – but they don’t have money to pay the interest on the existing debt? As an example of how relatively painless NOT raising the debt ceiling would be, here’s a link to a CNN story about alternatives to raising the limit. 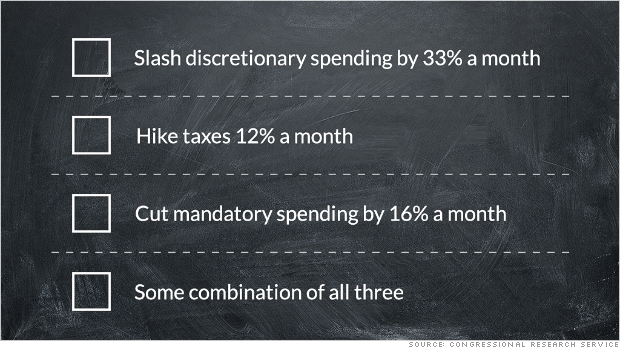 “Slashing” discretionary spending by 1/3 eliminates the problem. That could be done be simply withdrawing US troops from Afghanistan and other overseas wars. Fire all the border guards and use the US military to patrol the borders – isn’t that what the military is for anyway? I’m so sick of the rhetoric around this topic that I hesitated to say anything, because at least 90% will tune it out anyway. But dammit, I have to try to bring some common sense into the discussion.